If you're looking for something to do for Mother's Day in California, this is the guide for you. Whether you're spending a few hours or an entire weekend, try these ideas to find some fun things to do with her and find places to go that you both will enjoy. In the United States, Mother's Day is celebrated on the second Sunday of May. More than anything else, mothers want to spend time with their families on Mother's Day. Give mom what she wants — Rent a vacation home and get the whole clan together, whether they're related to you by blood or just your closest friends. Some of the most enjoyable places for a group get together include Pine Mountain Lake near Groveland and Yosemite National Park, Irish Beach just south of Mendocino, and Dillon Beach north of San Francisco. If you want to go somewhere else, you can also find lots of vacation rental listings all over the state, even in the cities through Airbnb and HomeAway. Calistoga: Napa Valley Wine Country's northernmost town has great mud bath spas that make a good place for a mother/daughter retreat — and kid-friendly sights nearby. Catalina Island: Whether mom wants to be active or chill out, she'll find a place to do it, and it's only a few miles from Los Angeles. Gold Country: Kids love to pan for gold while their moms of any age enjoy the old-fashioned ambiance of Gold Country's towns. Morro Bay: It's one of California's most family-friendly destinations with lots of water activities, shopping, and reasonably-priced lodging. Point Reyes and West Marin: A great getaway for an active family, with excellent hiking, beaches, kayaking, and gorgeous scenery. Santa Barbara: No matter how old you and your mother are, you'll find something that suits you both in Santa Barbara. Yosemite: Voted one of the best places in California for family vacations by TripSavvy readers, Yosemite is also a good place for Mother's Day Brunch at the Majestic Yosemite Hotel. Mother's Day is one of the busiest restaurant days of the year. All too often, service and food quality suffer. Take mom out on Saturday if you can - or find something else to do instead. 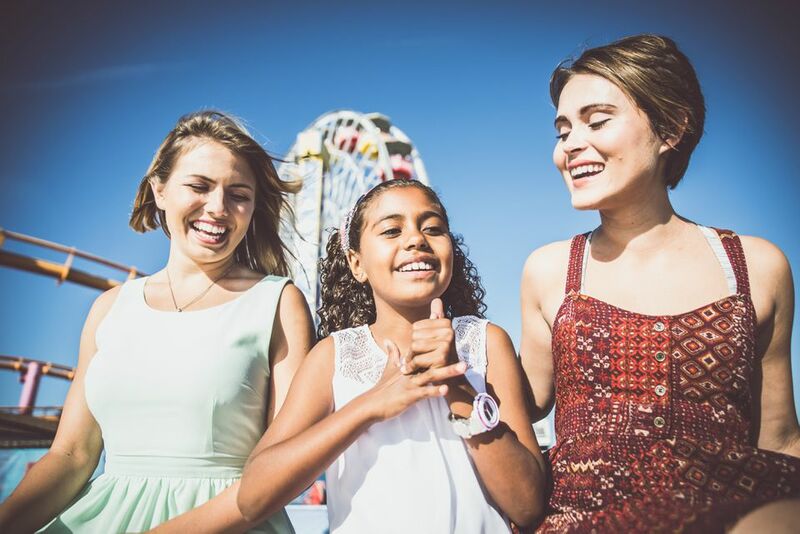 For a fun brunch outing that doesn't involve a restaurant, try Hornblower Cruises They offer champagne brunch cruises and Mother's Day brunch cruises in seven California locations. They're used to handling big groups, have room for little ones to move around, and the views are excellent. Or skip the brunch crowds and look for a sunset cruise instead. Huntington Gardens in Pasadena isn't the only pretty garden in the area, but they have plenty to see and a lovely children's garden and play area. You can find details of everything there and any special events on their website. If you're looking for a simple family day out in LA with mom, try these ideas for LA family outings which are good anytime. Poppies in Antelope Valley: Mother's Day happens near the end of Spring, but in some years, the California poppies in Antelope Valley hold off until early May to show their stuff. Any flower-loving mom would enjoy this one. Its nickname is Club Mud, but it's more fun than that sounds. Check out Glen Ivy Hot Springs if you're looking for a relaxing, mom and her grown kids experience. Any of San Diego's kid-friendly things to do would make a good Mother's Day outing. Take a day trip to Julian. If mom loves apple pie, antique stores, and cute little gold rush-era towns, she'll adore it. Visit the Carlsbad Flower Fields. The flowers are a happy by-product of growing the bulbs that produce them to sell. Depending on the weather, they may still be blooming over Mother's Day weekend, and you can buy some of the bulbs as a souvenir. Start your planning by checking these things to do with kids in San Francisco. If you want to take a family day trip out of town, try these ideas for San Francisco day trip. Mom probably scolded you a thousand times for getting muddy when you were a kid, but now it's your turn to tell her it's OK. That is, as long as the mud bath is at one of the spas in Calistoga that offer them as a super-relaxing spa treatment. Find out where to go for a mud bath — and what to expect from it. Eleven Roses Ranch is a bit of a drive from San Francisco to their location north of Napa, but moms of all ages will enjoy a fun day outdoors, a wagon ride, and meal at a historic ranch. Head up to Calistoga for a house tour like no other we've seen. You'll have to do it on a Saturday, but it's worth celebrating a day early when artist Carlo Marchiori opens his Villa Ca'Toga to the public. Add a relaxing mud bath spa treatment or lunch downtown, and you've got a great day out.